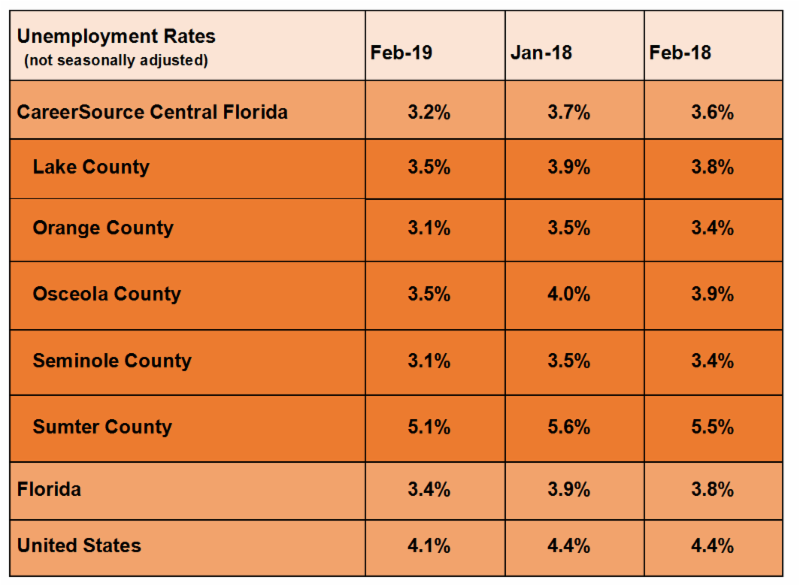 The unemployment rate in the CareerSource Central Florida region (Lake, Orange, Osceola, Seminole, and Sumter counties) was 3.2 percent in February 2019. This rate was 0.4 percentage point lower than the region’s year-ago rate of 3.6 percent. The region’s February 2019 unemployment rate was 0.2 percentage point lower than the state rate of 3.4 percent. The labor force was 1,391,110, up 39,538 (+2.9) over the year. There were 44,799 unemployed residents in the region. 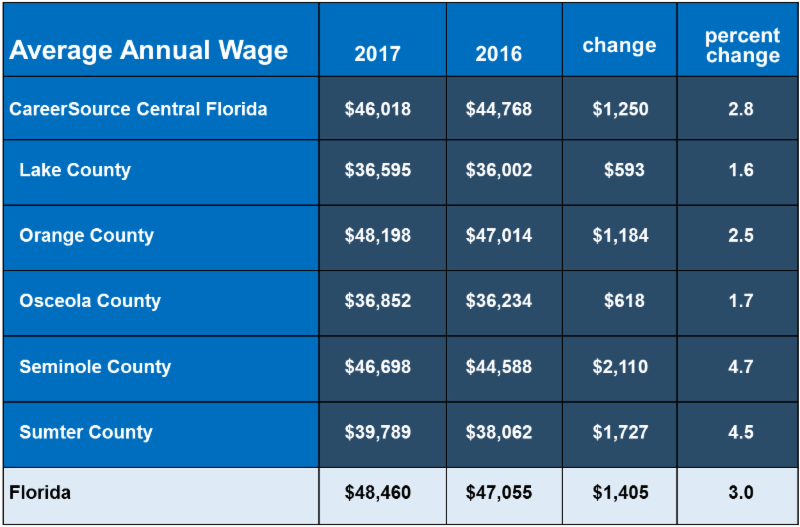 The unemployment rates for the five counties that comprise the Central Florida region were: Lake County (3.5 percent), Orange County (3.1 percent), Osceola County (3.5 percent), Seminole County (3.1 percent), and Sumter County (5.1 percent). 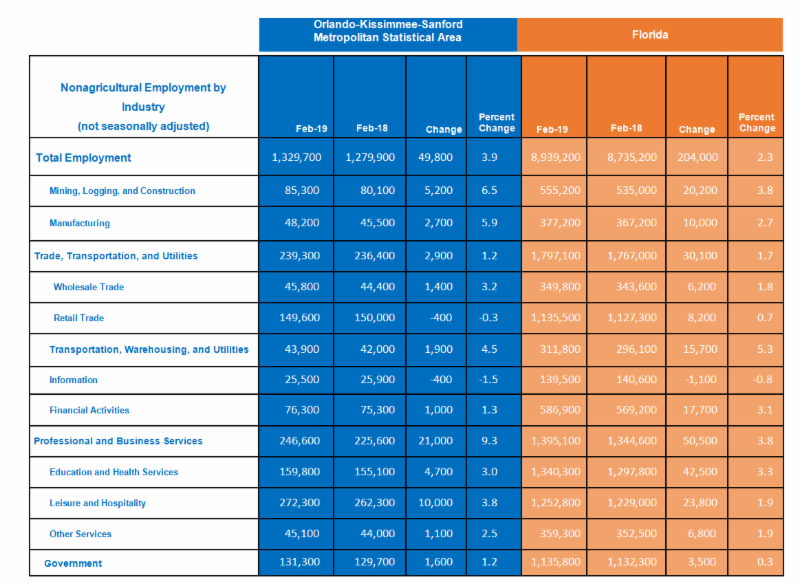 • In February 2019 nonagricultural employment in the Orlando-Kissimmee-Sanford MSA was 1,329,700, an increase of 49,800 jobs (+3.9 percent) over the year. • The Orlando-Kissimmee-Sanford MSA had the highest annual job growth compared to all the metro areas in the state in professional and business services (+21,000 jobs); leisure and hospitality (+10,000 jobs); mining, logging, and construction (+5,200 jobs); manufacturing (+2,700 jobs); and government (+1,600 jobs) in February 2019. • The Orlando-Kissimmee-Sanford MSA had the fastest annual job growth rate compared to all the metro areas in the state in professional and business services (+9.3 percent) in February 2019. • The Orlando-Kissimmee-Sanford MSA had the second highest annual job growth compared to all the metro areas in the state in trade, transportation, and utilities (+2,900 jobs) and education and health services (+4,700 jobs) in February 2019. • The professional and business services (+9.3 percent); mining, logging, and construction (+6.5 percent); manufacturing (+5.9 percent); leisure and hospitality (+3.8 percent); other services (+2.5 percent); and government (+1.2 percent) industries grew faster in the metro area than statewide over the year. • The industries gaining in jobs over the year were: professional and business services (+21,000 jobs); leisure and hospitality (+10,000 jobs); mining, logging, and construction (+5,200 jobs); education and health services (+4,700 jobs); trade, transportation, and utilities (+2,900 jobs); manufacturing (+2,700 jobs); government (+1,600 jobs); other services (+1,100 jobs); and financial activities (+1,000 jobs). • The information industry (-400 jobs) lost jobs over the year. • In February 2019 nonagricultural employment in The Villages MSA was 30,700, an increase of 600 jobs (+2.0 percent) over the year.